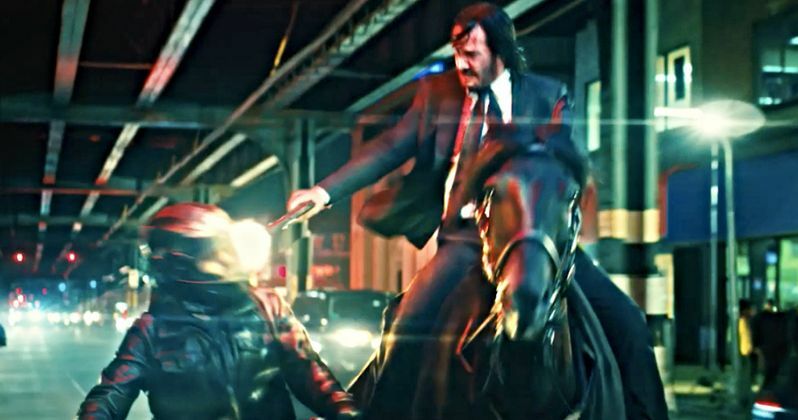 The first trailer for John Wick 3: Parabellum is finally here. Lionsgate has been hyping up the release of this first trailer for the past couple of days and, as promised, Keanu Reeves' legendary assassin is back in action in the first significant footage from the third chapter in the saga. Only this time, he's on the run and literally fighting for his life. Instead of being the one trying to fetch some gold for a contract, the price is on his head and that means one thing; lots of people are going to die. This will serve as the culmination to one of the most unlikely trilogies of the modern era. And, frankly, if they can manage to actually stick the landing, it may wind up being one of the best trilogies of the modern era overall. This Keanu Reeves franchise kicked off unassumingly in 2014 with the first John Wick, which wasn't given a huge push by the studio and flew under the radar a bit. But the cream rises to the top and the movie was simply too good to ignore. Critics loved it and those who actually did see it adored it as well, which led to very positive word of mouth. John Wick grossed just $88 million at the box office, but the sequel did just shy of double that, with John Wick: Chapter 2 bringing in $171 million worldwide. Much of that had to do with the fact that the sequel delivered the goods, but word of mouth had spread by that point. Can they manage to keep the hot streak going and stick the landing with John Wick 3? This is our first real look at whether or not that's actually going to be the case. Chad Stahelski, who has been with the franchise from the beginning, is back at the helm. He co-directed the first movie with David Leitch and flew solo on the sequel. The script comes from Derek Kolstad, who also penned the first two chapters. In John Wick: Chapter 3: Parabellum, our hero is on the run, as he's got a $14 million dollar contract on his head, which he earned for taking a life on the grounds of The Continental Hotel. While he should have already been executed, the Continental's manager and Wick's friend Winston gave him a one-hour head start before he's "Excommunicado." Now, our man must use other means to stay alive as he battles his way out of New York City. The cast also includes Ian McShane, Ruby Rose, Common, Lance Reddick, Laurence Fishburne, Hiroyuki Sanada, Jason Mantzoukas, Anjelica Huston, Boban Marjanovic and Oscar-winner Halle Berry. Lionsgate seems to have a great deal of confidence in what they've got, as they're releasing John Wick 3 right in the heart of the summer movie season on May 17. Will that big bet pay off? We shall have to wait and see. Be sure to check out the first trailer from Lionsgate below.